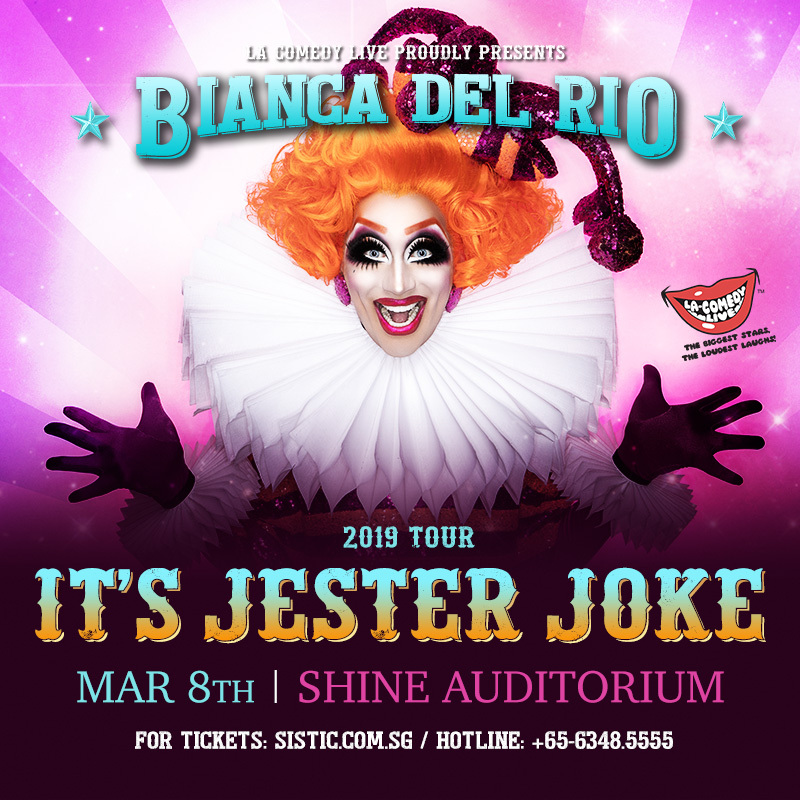 LA Comedy Live is excited to announce that the 'Joan Rivers Of The Drag World', Bianca Del Rio, will be returning to Singapore with her brand new show, 'It's Jester Joke' on Mar 8, 2019 at Shine Auditorium! The self-proclaimed "clown in a gown" tells tales of her world travels and the outrageous circus that is her life. Sure to keep audiences in stitches with her comical "tell it like it is" views, covering life from politics and travel to family and social media. It isn't all fun and games, though. There is an important life lesson to be learned through this fearless comedy show...sometimes we all just need to lighten the f**k up! Bianca Del Rio, the alter ego of seasoned comic Roy Haylock, has well and truly taken the world by storm. She quickly became a front-runner on the 6th season of RuPaul's Drag Race and was crowned the winner in May 2014. Being a fan-favourite throughout and after season six, she is considered by many to be the best winner of RuPaul's Drag Race. She is the only contestant never to place in the bottom three in any challenge during her run on the show and is statistically the best-performing queen overall. Del Rio is also the first Hispanic winner of Rupaul's Drag Race, with the second being her successor, Violet Chachki. Bianca's Instagram following soared to over 1 million followers and her shows The Rolodex of Hate, Not Today Satan and Blame It On Bianca Del Rio sold out to audiences all over the world. In 2013, Del Rio starred in the film Hurricane Bianca. A sequel, Hurricane Bianca: From Russia With Hate, was released in 2018.Bianca's last tour 'Blame it on Bianca' was a massive hit with sold-out shows across the world.